Great article from the Business Journal, a great donation to a great cause! 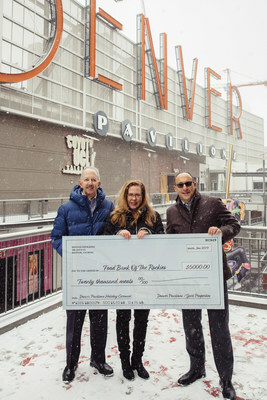 DENVER, Denver Pavilions’ is again providing a donation of $5,000 which allows the Food Bank of the Rockies to provide 20,000 meals for families in need. The donation was generated from ride revenue from Denver Pavilions’ Holiday Carousel. The 30′ carousel, located in the heart of downtown Denver on Glenarm Place, ran December 14, 2018 through January 2, 2019. The carousel, now in its fifth year, has become a holiday tradition in Downtown Denver. The Food Bank of the Rockies serves a critical function for the community. This donation will assist with replenishing stock that was partially depleted due to assisting furloughed federal government employees during the 35 day government shutdown. “Not only does the Denver Pavilions’ Holiday Carousel draw local and out-of-town visitors to the 16th Street Mall to help stimulate the downtown economy, but it also helps feed those in need in our community. This is a critically important cause at a critically important time,” states Mark Sidell, president of Gart Properties which owns the Denver Pavilions in conjunction with Rifkin Family Investment Company and MetLife. “We’re so grateful for this long and generous partnership with Denver Pavilions’ Holiday Carousel. Thanks to their efforts, this gift will help us provide 20,000 meals and allow hungry families to thrive. One in 10 people in Colorado struggle with hunger and 1 in 6 Colorado kids don’t always know where they’ll find their next meal. It’s heartwarming to know a carousel that brings such holiday joy will also bring nourishing food to those in desperate need,” said Erin Pulling, Food Bank of the Rockies’ president and CEO. Denver Pavilions is a one-of-a-kind retail, dining and entertainment center located in the heart of downtown Denver on the 16th Street Mall, providing a critical mass of more than 40 retail tenants, restaurants and entertainment venues. The open-air Denver Pavilions features three-story buildings on a two-block development that is linked by “The Great Wall,” an exterior structure featuring the word “DENVER,” now coined as the #BestViewOfDenver, has become a favorite photo opportunity for locals and visitors alike. Denver Pavilions has become a destination for the metropolitan region, with such marquee tenants as the first-in-market Uniqlo, Sephora, H&M’s flagship store featuring an expanded children’s department and one of only five H&M Home departments in the U.S., the first-in-market video arcade FTW (For the Win), a remodeled 15-screen United Artists Theatre with state-of-the-art, full recliner seating and an in-theater bar plus a newly remodeled Victoria’s Secret and Bath & Body Works. For more information, visit DenverPavilions.com.